Untamed Russia | Untamed Borders - Adventure travel..
Russia – The world’s largest country. Stretching across two continents and nine time zones, much of it remains as cut off from western visitors today as it was under the Soviet Union. With dozens of mountain ranges, taiga, tundra, desert, steppe, a 37,000km coastline, shamans, a multitude of indigenous tribal and nomadic groups and much of the country completely unconnected to any road or rail network – there is much more to experience in Russia than St Petersburg, Moscow and long train rides. Tapping into our guides’ years of experience we can take our guests into bits of Russia that are rarely seen by Russians let alone outsiders. We can show you life in Europe’s only Buddhist Republic, delve into the taiga, a forest so vast it would envelop the USA, or experience the jaw-dropping natural beauty and active volcanoes of Kamchatka. As always it is the people that make the trips and our guests fondest memories are often the time spent with the nomadic Nenets reindeer herders of Arctic Siberia’s Yamal Peninsula or enjoying the warm hospitality of Chechens, Daghestanis and Ingushetians in Russia’s much misunderstood Caucasus states. There are even opportunities to venture into parts of Russia that aren’t officially in Russia like the disputed Republics of South Ossetia and Abkhazia. If you are looking for travel inspiration and want to get truly off the beaten track then look no further and join us on a trip into Untamed Russia. The Russian Caucasus is an enchanting region, ethnically diverse with towering, rugged mountains. However, since the end of the Soviet Union it has been more infamous for insurgency. Chechnya was for 20 years a byword for a failed state. However, behind the headlines there is much to enjoy in this misunderstood region. Exploring the UNESCO world heritage city of Derbent in the far south of Daghestan, experiencing the personality cult of Ramzan Kadyrov in the new, glitzy Grozny or standing in awe before the soaring stone Chechen watchtowers of Itum Kale are just some of the tapestry of experiences on offer in Russia’s far south. All set off with a backdrop of the sublime Caucasian mountains topped by Europe’s highest peak, the two-headed Mt Elbrus. In 2012 we became the first British travel company to run trips to Chechnya so get incontact with us on one of our ground breaking trips to the region. Countless active volcanoes, including the Northern Hemisphere’s tallest, dot Kamchatka, a peninsula dangling into the Pacific Ocean from the far north east of Russia as if forgotten by the rest of the country. The bears that infest the region catch salmon in its pristine rivers, reindeer herders migrate through the wilderness with their animals and the few tourists lucky enough to make it here stand awestruck before some of the planet’s most breathtaking natural beauty. Travel here is not easy due to the unforgiving nature, combined with an almost complete lack of infrastructure or even roads. But for those intrepid travellers who persevere it sure is rewarding. 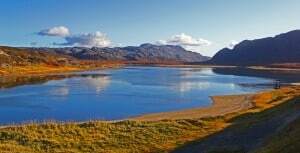 What’s not to love about Kola – stunning natural beauty, a juxtaposition of indigenous reindeer herding and Arctic Russian cultures, fascinating archaeological relics from the Stone Age hidden away in the mountains and easy access from Moscow make it extremely surprising that this destination is still completely off the tourist radar. Watching the Saami people bring a 4,000-head herd of reindeer down from their winter pastures in the heights of the mountains is an unforgettable experience, as is travelling between timeless, isolated log cabin fishing villages of the Pomors, people who left Russia in the Middle Ages to live here in the Arctic. The lower reaches of Europe’s longest waterway reveal a number of fascinating town and cities. The Volga empties into the Caspian Sea at elegant Astrakhan with its mix of medieval Russian and Islamic buildings. 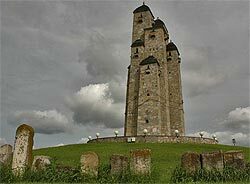 The nearby Buddhist Republic of Kalmykia and its chess obsessed, stupa strewn capital Elista are one of Russia’s strangest secrets and the sobering sites of Volgograd, the setting of perhaps the 20th century’s most significant battle, the siege of Stalingrad, the turning point of the Second World War, is an experience in itself. 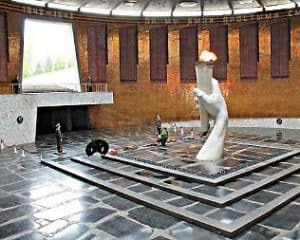 The great patriotic war was most heavily felt in Russia and the cities bombastic memorial architecture doesn’t let you forget that. Large-scale nomadic reindeer herding, along with the traditional culture, language and religion of the nomads, has been better preserved on Arctic Siberia’s Yamal Peninsula than anywhere else in the world. 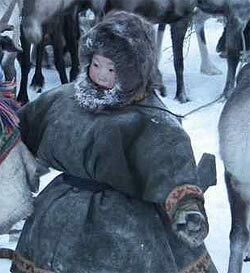 Here the Nenets people migrate year round through the tundra on sledges with herds of up to 10,000 reindeer, living in conical reindeer-hide tents and dressed in reindeer fur clothing. They have Asian features, speak a language unrelated to Russian and sacrifice reindeer to the spirits and gods of an ancient animistic religion that governs every aspect of their daily lives. Many of their tools and sledge parts are made from reindeer bone, their ropes and lassoes are made from reindeer rawhide and the thread they sew their clothes with is reindeer sinew. The Nenets’ favourite meal is aibat, which is when they strangle a reindeer then eat its raw meat and drink its warm blood straight from the carcass. Reindeer here, in short, equal life. Tuva is situated in the far south of Siberia bordering Mongolia and its capital city, Kyzyl, is also the location of the geographical centre of Asia. In the early 20th Century it held the status of being a sovereign and independent nation known as Tannu Tuva. Despite it now being a federal state of Russia, the region has maintained a strong and unique identity through the preservation of their mother tongue and a fierce pride in their local culture and history; it’s exactly this singularity that creates a sense of Tuva being a nation within a nation. To most foreigners, and even Russians, the region remains a bit of a mystery despite its renown for the ancient musical art of khoomei (throat-singing). Nevertheless, the hardy few who choose to venture in to this outer fringe of Siberia will be rewarded with captivating vistas of rivers winding their way through expansive taiga forest, rolling steppe home to nomads and isolated mountains hiding deer, bears and more. Untamed Borders is one of the most experienced adventure travel companies working in the Russian Caucasus region. We regularly organise tailored trips in this fascinating region. Please get in touch for more details.